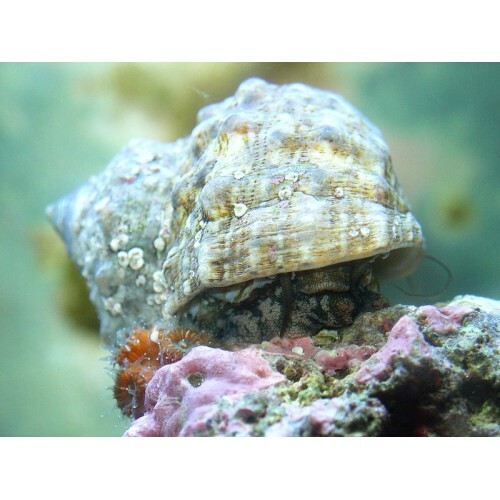 The Mexican Turbo Snail is extremely popular among reef hobbyists, since it quickly eliminates large amounts of nuisance algae. It is particularly fond of hair algae and will consume mass quantities of it and other algae off your live rock and aquarium glass. Also known as the Turban or Top Shell Snail, Turbo fluctuosa has a thick, top- or turban-shaped shell with an irridescent interior. The Turbo Snail is native to the Gulf of California off the coast of Mexico. An excellent member of your aquarium's cleanup crew, the Turbo Snail thrives in crevices and holes in natural reefs. In the home aquarium, the Turbo Snail needs ample hiding places and large spaces to graze. Some reef aquarists prefer to keep the Turbo Snail in aquariums with well-secured rockwork since this active herbivore is known to bulldoze loose rocks in search of food. The peaceful Turbo Snail should not be kept with aggressive tankmates that can quickly overcome this slow-moving creature. If algae levels are insufficient, supplement the diet of the Turbo Snail with dried seaweed. Also, adequate calcium levels are required to help this member of the Turbinidae family build its protective shell. Like other invertebrates, the Turbo Snails is very sensitive to copper-based medications and high nitrate levels. To acclimate the Turbo Snail, employ the drip-acclimation method since it is intolerant of even the smallest fluctuations in water parameters.